What is this doll called, what type? Year made? Any details are much appreciated, thanks. It says EFFENBEE on the back of the neck. Fingernails appear to be originally painted. 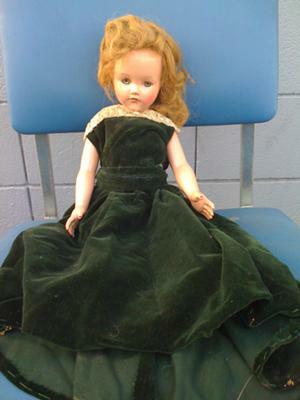 It would help to get you a little more info on your doll if you could help us a little first. Could you measure the height of the doll is there any more wrighting or numbers anywhere else on the doll and where? What kind of material does she appear to be made of? from the pic, my guess would be vinyl. can you take the dress off to get a better pic of the doll and lay it down so we can have a straight on of it to see the face better too please. All these things will help us help you. Its hard to see and not much info to go on to give you what you are asking for.